Resurgent form and a dose of good fortune played their part as Bayer 04 Leverkusen secured their passage to the group stage of the 2016/17 UEFA Champions League somewhat unexpectedly ahead of schedule, according to Christoph Kramer. Speaking after helping Die Werkself put the seal on a third-placed finish with a 2-1 victory over Hertha Berlin, the Germany international midfielder explained the whys and wherefores of the Rhineland outfit's late-season revival, discussed his side's prospects of one day closing the gap on the Bundesliga's top two and looked ahead to next weekend's meeting with former club Borussia Mönchengladbach. Question: Christoph Kramer, with two games to go, Leverkusen have achieved their goal of qualifying for next season's Champions League. Is it something you anticipated a few weeks back? Christoph Kramer: No, definitely not. It's not what was expected. Question: After you took an early 2-0 lead and Hertha reduced the arrears, it was a pretty tough game. What did you make of it? 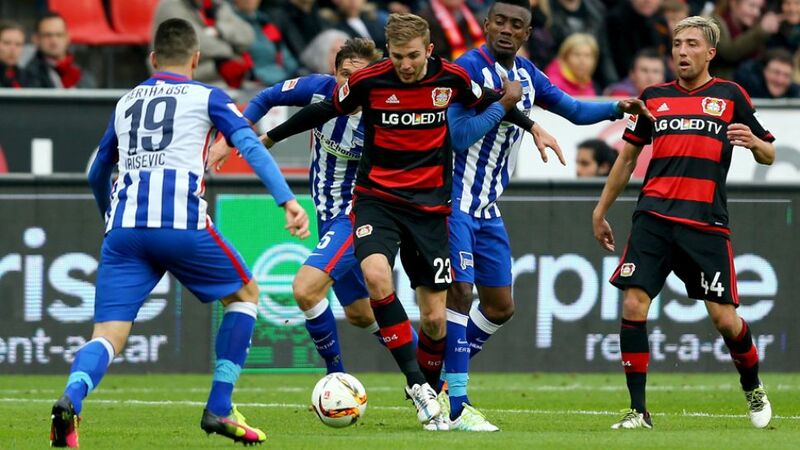 Kramer: I don't think Hertha had a clear-cut chance, perhaps other than the shot from Alexander Baumjohann. It was a tense game. Anything can happen when you only have a one-goal lead, but we had chances through Stefan Kießling and a couple for Karim Bellarabi. We should have put it to bed earlier. Then it wouldn't have been so tense. We did well. Question: Nominally, Leverkusen are now the third best team in Germany. Are Bayern and Dortmund attainable for Bayer 04? Kramer: That's a really tough question. After last season, I said it would be really difficult to catch Wolfsburg. For me, Wolfsburg were guaranteed second or third place. Now they're tenth and just lost 5-1 to Dortmund. It's going so well for Tuchel's Dortmund and Bayern that I think it will be difficult to match them over the course of an entire season.